At long last, a streak of warm sunlight beams through my kitchen window. The day brings to mind Easters in Rome and the city’s abbacchio, butter-tender baby lamb, and the first artichokes of spring. 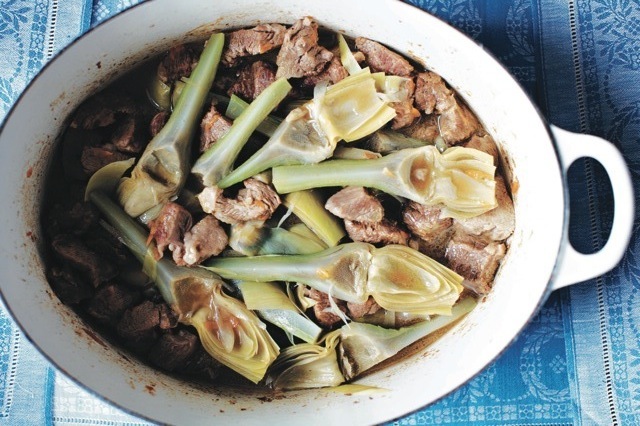 No one, but no one, makes lamb and artichokes taste better than the Romans, though my mother would disagree. 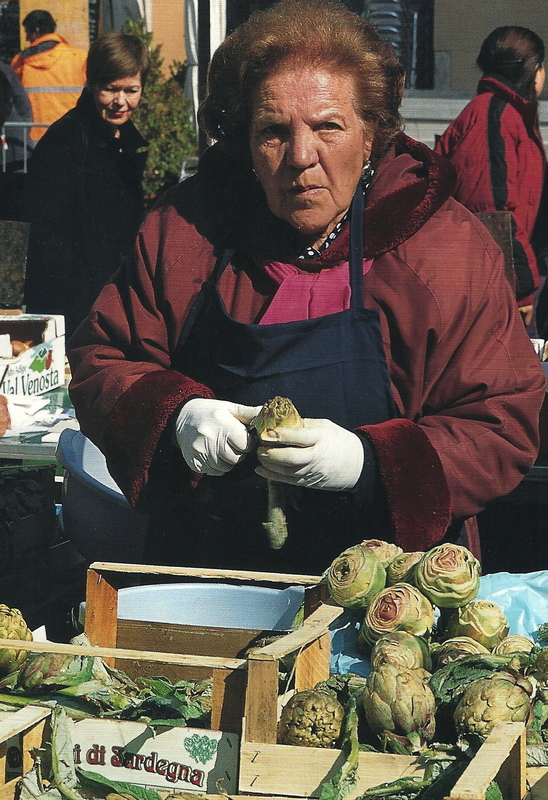 Being from Sardinia (Sardegna) where some of the best artichokes in the world grow under that island’s blazing sun, the thistles are a religion in her house. 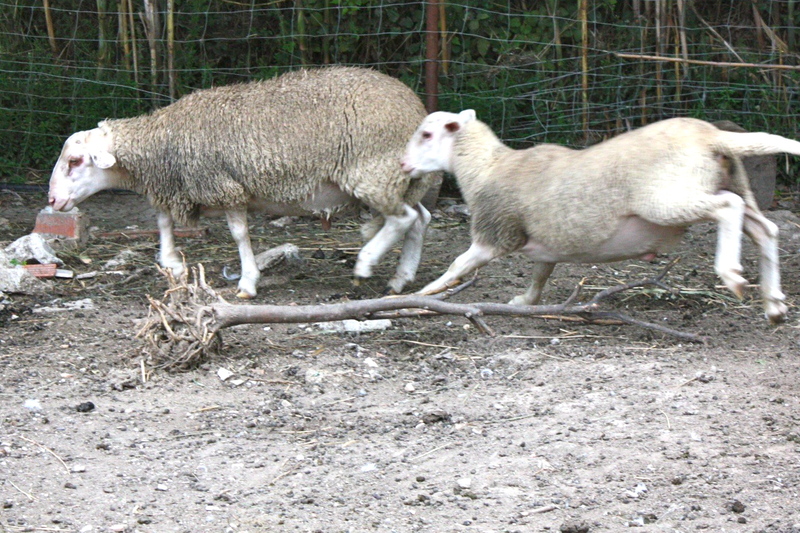 In a region where there are nearly twice as many sheep as people (some 3,000,000 of them to about 1,675,000 Sards), you know that lamb cookery is a serious affair. But I’ll not attempt to quibble over where it is made best. Indeed it is a dish difficult to reproduce anywhere else. 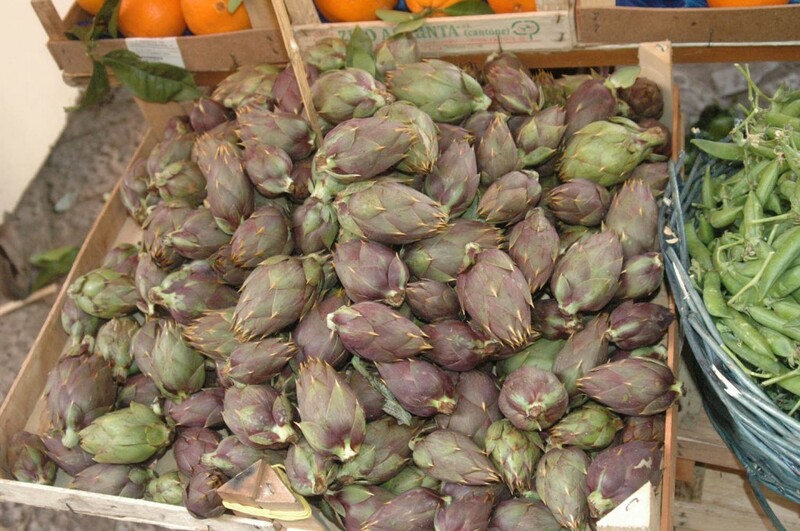 The abbacchio of Rome and Sardinia is not easy to come by, nor are the sun-drenched artichokes of those southerly fields where the choke flourishes. 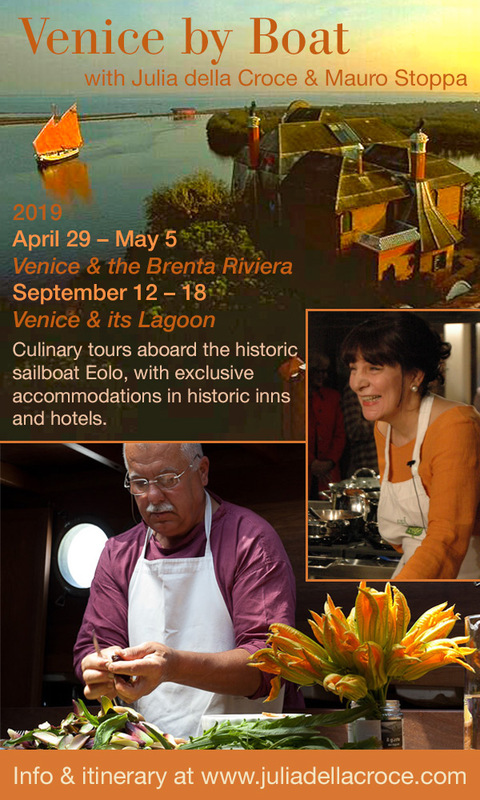 So instead I offer some advice on the best way to approach this authentic recipe, unchanged since its Roman author gave it to me a few years ago, and you will produce a splendid dish that celebrates Spring, symbolically and deliciously. Let’s begin with the artichoke, as misunderstood as it is off-putting in its prickly armor (one does wonder who the first adventurous eater was who figured out what pleasure lay beneath its hoary choke). I don’t want to say how many times I’ve ordered artichokes in even the most well intentioned restaurants outside of Italy, only to find a pickled specimen on my plate, not a fresh one. A pickle is a pickle, whether cucumber or artichoke. For this recipe, or any other calling for fresh artichokes, look for them in the fresh produce section when they are in season–not put-up in a vinegar bath, pre-grilled and sott’olio (under oil), or otherwise pre-cooked or preserved. If you don’t find them fresh, simply wait until you can. As for the lamb cut you’ll need for this dish, go to a butcher and ask for the shoulder, the most melting stew cut for lamb. It has terrific flavor and when cooked in a braise or a stew, the juicy meat will nearly burst in your mouth with succulence at the first chew. 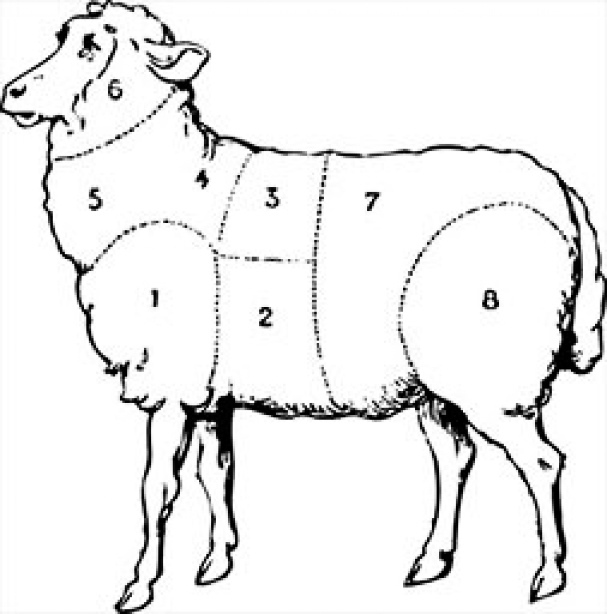 Section one shows the top round of the lamb. This is a dish for the season, maybe my favorite of all made from lamb, adapted from a recipe given to me by my Swedish-born friend, who has lived in Italy for most of her life. She learned how to cook the lusty dishes of the Roman countryside from her mother-in-law, and passed many of them on to me. The preparation is quite simple. Artichokes are technically in the thistle family and native t0 the Mediterranean Basin. They thrive in dry, torrid climates, so shipping them to far-flung places so that people like me with an artichoke habit is, admittedly, not a sustainable practice (though my friend and neighbor, master gardener Joan Gussow, grows them in her riverfront garden in the Hudson Valley, NY). 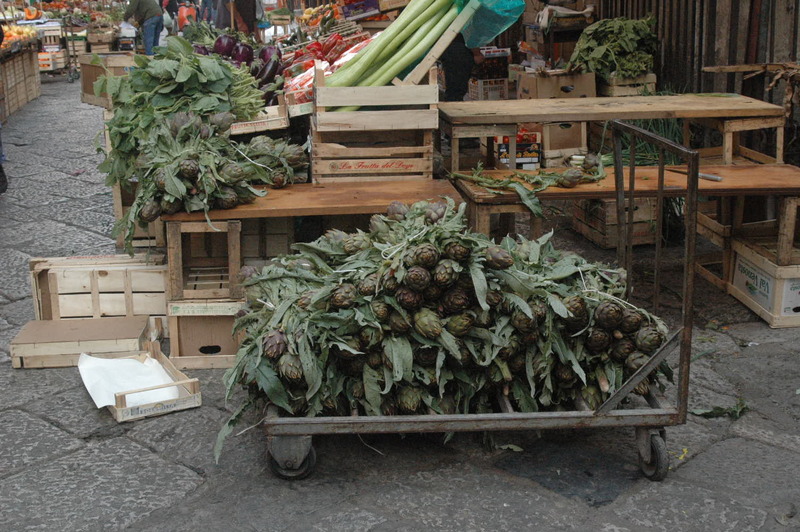 There are many different varieties of artichokes, from walnut size to the size of a small grapefruit and ranging in color from deep purple to pale green. As with most vegetables, bigger is not better. The older the artichoke, the tougher it will be. The edible part, the “heart,” the fleshy base of the flower bud is tender enough to eat before the artichoke begins to flower. As with many vegetables, artichokes are best eaten on the same day they are picked, though such freshness isn’t feasible for most of us. 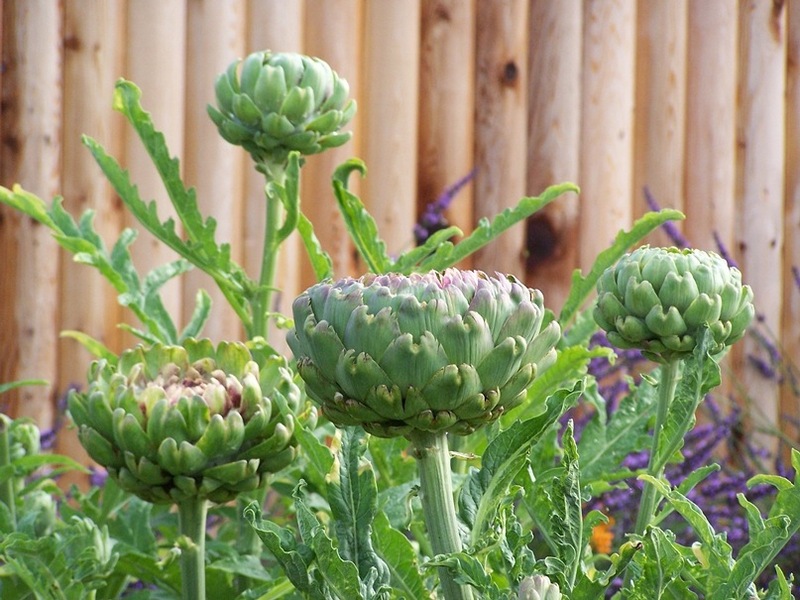 Look for artichokes with leaves that cling tightly to the body of the thistle and are not slack and pointing out. The color should be clear and bright, not streaked with brown or black. Stems should be rigid and brightly colored, not flabby and black. The thick, aromatic gravy calls for serving the stew with plenty of sturdy bread, and alongside polenta, or potato puree. Serve a full-bodied red wine at the table. 1. To trim the artichokes: Add about 6 inches of water to a large glass or ceramic bowl (do not use metal), then squeeze the juice of one of the lemons into it. Trim a thin slice from the bottom of the stem of each artichoke. Pare off all the dark green skin on the stem. (The flesh of the stem is tasty.) With one hand, pull off the tough outer leaves until you reach leaves that have tender white areas at their base. Using a serrated knife, cut off the upper dark green part of the inner leaves; leave the light greenish-yellow base. The inner rows of leaves are the tender part you want, so be careful not to cut away too much. (If you are using baby artichokes, keep in mind that they are more tender, thus there will be fewer tough outer leaves to remove.) Cut the artichoke in half lengthwise and, with a small knife, cut out the hairy choke and any other tough inner purple leaves. As each artichoke is finished, immediately put it in the lemon water to prevent it from turning brown. (Once cleaned, the artichokes can remain in the lemon water in the refrigerator for up to 24 hours.) When all of the artichokes have been trimmed, drain them, cut each half in half again, and pat dry. Place each artichoke half, cut side down, on a cutting board, and cut into quarters lengthwise. Cook the sliced artichoke hearts in boiling water to cover for 10 minutes. Drain and set aside. 2. Trim the excess fat from the lamb. Cut the meat into approximate 1½-inch pieces. Pat thoroughly dry with clean kitchen towels. 3. Lay a piece of waxed paper on your work surface, about the size of a standard cutting board. Scatter the zest on the wax paper and roll the meat in it . Spread the meat out on your work surface in a single layer. Sprinkle it lightly with the flour; shake of any excess. 4. In a large, heavy skillet or Dutch oven, warm the olive oil over medium heat and add the lamb pieces. If your pot is not large enough to accommodate the meat with plenty of room for it to sear properly, brown it in batches or in two separate pots. Brown nicely all over, about 12 minutes. Add the garlic, carrot, and salt. Stir in the wine. Cook to evaporate it, about 2 minutes. Cover half-way with stock, reduce heat to low, partially cover and cook, adding more broth a little at a time as needed, until the lamb is tender, about 1¼ hours. Check the pot frequently to prevent the meat from drying out. When the meat is almost done, add the artichoke hearts and cover. Cook over low heat until the artichoke hearts are tender and the flavors of all the ingredients marry, about another 10 to 15 minutes. Stir in the dill or fennel and the pepper after cooking. Ahead-of-time note: You can make the stew a day or two in advance up to the point where you add the artichokes and the dill or fennel fronds. Let the meat cool, cover, and chill. When ready to finish the stew, reheat it gently and slip in the artichokes and stir in the fresh herb just before serving. 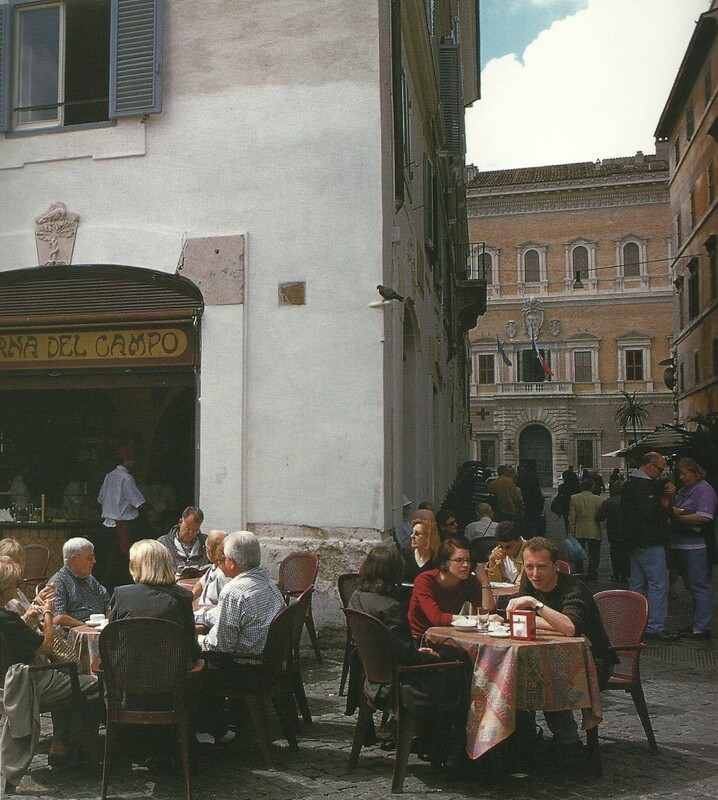 You have captured the essence of Spring in Rome! Just lovely! What a wonderful article. The photographs are really lovely. They make me want to pack my bags right now. Thank you also for all the tips on artichoke cookery. I will be the first to admit I am artichoke challenged! I hope you had a wonderful Easter!